A year after their heroics at Euro 2016, Wales’ World Cup hopes are in the balance going into Sunday’s crunch game in Belgrade against Serbia. And while Clarets striker Sam Vokes doesn’t feel it’s quite a must-win game for the Red Dragons, he believes Chris Coleman’s men can’t afford to lose in the Rajko Mitić Stadium (7-45 p.m.). Wales are four points adrift of Group D leaders Serbia, who are level on points with the Republic of Ireland. 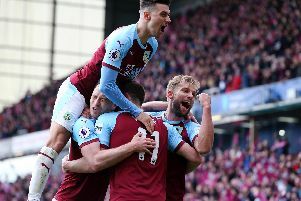 Vokes, who ended the season bang in form with five goals in as many games to finish as Burnley’s top-scorer, looked ahead to an important evening: “It’s a huge game for us, Serbia away. “In the group so far, I suppose we were favourites coming out of the Euros in the summer, and for us it was important to start well, and we’ve picked up a few too many draws when we should have had wins. “It’s the halfway stage of the group so it’s time to turn it around. “It’s not do or die time quite yet, but we need to go to Serbia and definitely not lose. “We’ve been up in games and cruising and given away a couple of sloppy goals which has killed us so far, so we need to turn those draws into wins. Vokes headed a memorable goal to clinch a 3-1 win over fancied Belgium in the quarter-finals of the Euros last summer, before eventual winners Portugal triumphed 2-0 in the semis. And the 27-year-old admits Wales are no longer a surprise package, and there has been added pressure to produce: “Definitely. Going into the group as favourites and being the top seed is a big achievement for Wales. “But the other side of that is that you are expected to pick up results where we probably haven’t done so far. Wales have become a scalp, and Vokes added: “I think so. I think the whole mentality has changed with it. “Now we’re getting big crowds, we’re filling grounds, in the previous group we were probably getting five or six thousands fans. “It’s a completely different mentality on the match day and the away team probably thrive on that, they want to beat Wales now. Vokes gets married shortly after the Serbia game, and is keen to sign off his season on a high, and try and make a big stride towards a place in Russia next summer: “The lads have got the buzz for it.